Complementing the lens itself, the silver FUJIFILM XF 23mm f/2 R WR Lens with UV Filter Kit from B&H pairs the sleek wide-angle prime with a 43mm UV filter. Designed as a compact, walk-around prime, the silver XF 23mm f/2 R WR from FUJIFILM is a versatile 35mm-equivalent lens characterized by its f/2 maximum aperture that strikes and ideal balance between portability and speed. The optical design features two aspherical elements to reduce distortion and spherical aberrations in order to produce greater sharpness and accurate rendering. A Super EBC coating is also used to control flare and ghosting for improved contrast and color fidelity when working in bright and backlit conditions. Complementing the optics is a stepping motor, along with an internal focusing design, which provides quick and especially quiet focusing performance. Additionally, the lens is weather-sealed to suit working in inclement conditions. The Hoya 43mm UV Haze NXT HMC Filter is a general use, clear filter that helps to absorb ultraviolet light and protect the front of your lens. Its clear design allows you to pair this filter with others or leave on lenses at all times as a general protective filter. It can also help to reduce dust and moisture and keep them from reaching your lens element while providing additional protection in case of drops or situations where scratching could occur. Hoya HMC filters are multi-coated for reducing flare, ghosting, and reflections on the filter surface. As a result, over 97% light transmission is possible in order to maintain contrast and color fidelity. The UV NXT filters are constructed from high quality, heat-resistant, high-transparency optical glass and a precision milled low-profile aluminum frame. Absorbs UV light, which can cause outdoor photos to appear hazy and indistinct. HMC multi-coating affords greater than 97% light transmission and helps to reduce flare, ghosting, and reflections on the filter surface for greater contrast and color fidelity. Box Dimensions (LxWxH) 5.5 x 5.2 x 4.3"
Box Dimensions (LxWxH) 4.0 x 3.0 x 0.3"
XF 23mm f/2 R WR Lens with UV Filter Kit (Silver) is rated 4.9 out of 5 by 412. Rated 5 out of 5 by Fuji X Photographer from One of Fuji's Best! Great lens! Razor sharp, crisp contrast and has beautiful bokeh. I shoot on Fuji cameras and have shot with a good amount of the Fuji lenses and have to say this is up there in terms of quality. Before this I would've said the 35mm F2 was my favorite lens but this is definitely more crisp and has better bokeh of course. (75mm eq) This lens is for a different purpose then the 35 F2 but it continues to surprise me. I can't imagine finding someone who doesn't like this lens honestly. 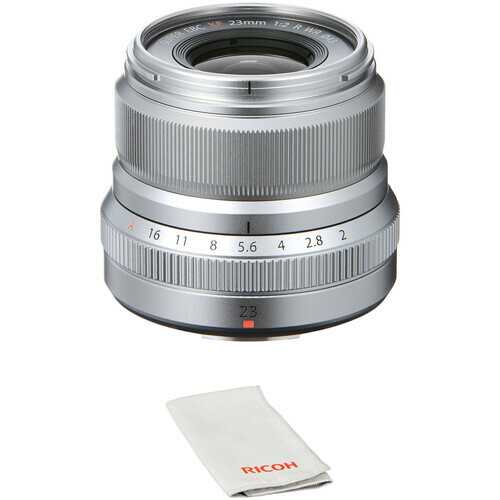 Can't think of any cons for this lens, just pros: nice size (Med-small), crisp contrast, pin sharp, beautiful creamy bokeh, super fast auto focus (faster than 35 F2), basically silent auto focus, and a good portrait lens. Rated 5 out of 5 by Anonymous from Reminds me of my Sumicron 50 This lens is compact, beautifully made, and renders a delightful image both in the sharp and out of focus areas. Good microcontrast renders fine detail well. Focusing is definitely faster than the 35 f1.4. The look overall is different than the latter lens possibly due to increased sharpness. Handling is superior to the 1.4 and manual focusing is also superior due to good damping yielding a better tactile experience; further, the aperture ring is usefully more resistant giving both a more confident feel and less likelihood of unintentional change. Overall, a joy to use and renders outstanding results. I would not hesitate to have this as my only Fujifilm 50 mm (equiv) lens. Rated 5 out of 5 by Anonymous from Just what it should be I bought and tried the 35 F2, and as soon as I learned Fuji was going to release a 23mm to match, I put myself on the list to be notified of its availability. I was so right. The lens is exactly what I had hoped for: light weight, compact, well-made, sharp, and contrasty. I loved the 23 F1.4, but it just seemed too big for the X-Pro cameras, with its big lens hood getting in the way of the image in the OVF. With both these lenses, I particularly like that the lens caps fits on the lens but also on the lens hood, so you don't have to remove the hood to apply the cap. Just a dandy lens. Rated 5 out of 5 by Anonymous from My new workhorse lens Just came back from weeklong trip along California Coast, where newly bought Fujifilm 23mm f/2 WR was used to take over 50% of my pictures. It seem to be ideal for street and casual photography, where small size and fast focusing is a definitely a great benefit. It produces also excellent results for landscape and architecture photos. Barely visible distortion and perhaps minimal vignetting, not really recognizable on most of the pictures. Very sharp and solidly built, it will most definitely be one of my most frequent travel lenses. Rated 5 out of 5 by Scott from Another Great Fuji WR Lens Another great lens from Fuji in the growing WR family. I love this lenssharp, extremely fast focusing, and a very useable focal length. Some have noted a slight softness in the corners up close, but I'm not seeing it. I've tested this lens agains my Zeiss 32 Touit, and Fuji 18-135 WR lens. Using the zoom lens at 23mm with identical f-stop, the 23 prime proved much sharper in capturing detail, which is what I might have expected. In comparison to the Zeiss lens, I felt the 23 WR was a tad sharper, but I liked the color detail on the Zeiss slightly better. But the Fuji lens focuses much faster. If I had to keep only one of these three lenses, I'd keep the 23 WR without hesitation. Rated 5 out of 5 by BD from An ideal carry lense for the XPro2, or, XT1 or 2 This is a really compact 35 (sorry, 23) f2 that reminds me of nothing so much as the Leitz 35 Summicrons. I have and rely on the 23 1.4 for shooting in really low light, but in looking at images produced by both the 1.4 and this f2, which is markedly smaller and lighter - though definitely a solid lens, both lenses produce outstanding images. On balance, the 23 f2 seems to focus faster than the 23 1.4, but otherwise it's hard to tell the two apart except for size and the different apertures. This is one of the first times I've invested in two lenses of the same focal length, and I am glad I have. Rated 5 out of 5 by Donald from Excellent! Beautifully made. Mounted on my XT-1 after using the 18-55 for the full time that I've had the camera, I noticed there's a balance and a lightness to the camera significant. Not that the 18-55 is not balanced on the XT-1, the 23mm f2 is definitely better. Image quality with this lens is very sharp across the frame. The aperture ring detents in 3rd stops are just right. Fuji obviously worked to get this right. Glad I opted for the f2 over the 1.4, not because of the cost but because I don't need 1.4 for landscape work and even indoors I feel I can make things happen, its a mirrorless camera right? Rated 5 out of 5 by rxritch from Fuji is giving everyone a run for their money I am a Nikon shooter from the 80's from the FG to my current d810. Dabbled in some sony mirrorless and some canon dslr and have always come back to Nikon. I like trying new gear have done so continuously for several decades, and still come back to Nikon. Funny though in the film days I switched from Kodak to Fuji, and now it seems quality for quality I'm using fuji. It has not completely replaced my Nikon....yet, but with lenses like this 23 f2 it's well on its way. I find using the xt-2 with the 23 vs my d810 and the sigma 35 art so similar it's uncanny. Way to go Fuji! Does the kit with UV filter come with the lens hood? When you will be able to delivered it?when will be in stock this lens? Please email us at photo@&lt;a href= http://bhphoto.com target= _blank &gt;bhphoto.com&lt;/a&gt; for assistance with your inquiry. Unfortunately no, this includes a Limited 1-Year USA manufacturer warranty from Fujifilm. anyone know when the LH-XF35-2 lens hood for the 35mm f2 will be available for sale or pre order? Can I buy this lens from this website from Italy? How many tax should I pay? How much will cost shipping? Where is this lens made (2019) ? Does this lens usually comes with 2 lens hood? Does this lens feature image stabilization? No, but it is small and light, I don't think I've ever had a motion blur problem with it.